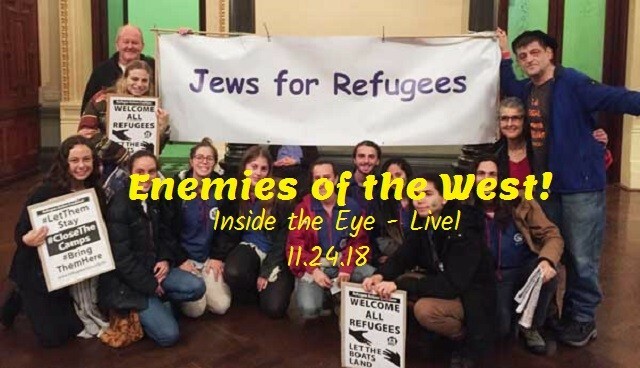 The Nationalist-Jewish Link | Inside the Eye - Live! In what was a very good show, we destroyed the “We are all migrants” myth. This was followed by highlighting the disconnect from reality in the United Kingdom as British grasp with the reality that their country is rapidly being lost without a defense by those who represent the traditional national character of what is “the United Kingdom”. In hour 2 we discussed the need for perfecting political perception and the need for seeing politics through multiple lenses. It is a form of “triangulation”: the more sources you are able garner, providing that these sources are themselves accurate or even source sets of information, the better you are able to have a clearer political perception. Numerous audio clips were brought in to augment the show. Katie Hopkins from Britain’s LBC Network was brought on to discuss what for us is a clear disconnect. On one hand, Katie is rapidly pro Israel, while on the other hand, she is anti-immigration. She seems to be at a loss as to how to reconcile the fact that “progressive Jews”, the left wing of Jewish political organization, remain the most vocal proponents of mass migration, while the right wing of the Jewish community controls the government and is behind laws intended to criminalize legitimate dissent against migration to the UK. The reality that Jews on the left and right are themselves are at war for power, but when it comes to the larger agenda, the destruction of Western civilization, they are working collaboratively as one side funds and organizes replacement migration while the right wing criminalizes dissent. It is the Nationalists of Europe who are largely working with the Jewish right wing. Without question, the recent conference on antisemitism in Austria highlighted that Jews have been working against the interests of their host countries. Quite a lot to be gleaned from this show so worth a listen.